This is another Navaho figure which I secured from the same Indians who taught me the preceding figure. First: Hold the string between the thumb and index of each hand so that a short piece passes between the hands and a long loop hangs down. 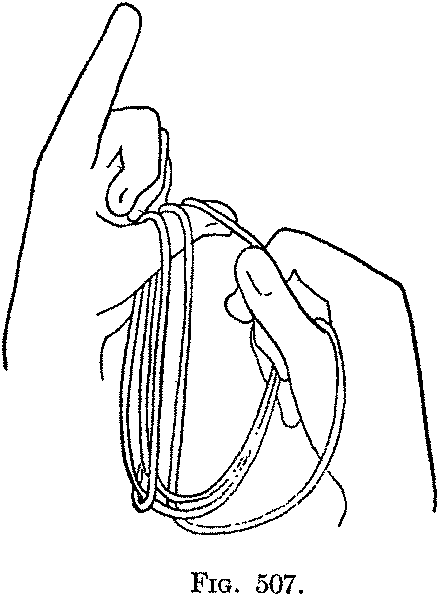 Make a small ring, hanging down, in the short string, putting the right hand string away from you over the left hand string. 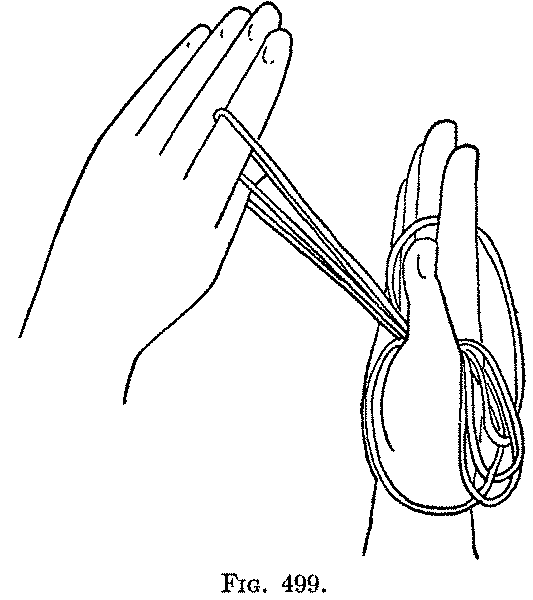 Insert the index fingers into the ring downward and toward you and with the thumbs in the long hanging loop separate the hands and, turning the index fingers upward and outward, with the palms of the hands facing away from you, draw the strings tight. Holding the right hand with the palm away from you, move the left hand first to the right between your body and the right hand and then away from you over the right hand, and lay all the left strings, doubled back on the right hand strings, between the right thumb and index (Fig. 499), and hold them there by pressing these two fingers together. 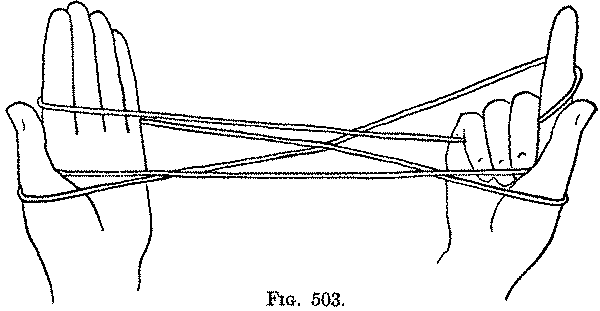 Then, separating the hands slightly (not enough, however, to pull the strings through the right thumb and index), draw the strings moderately tight (Fig. 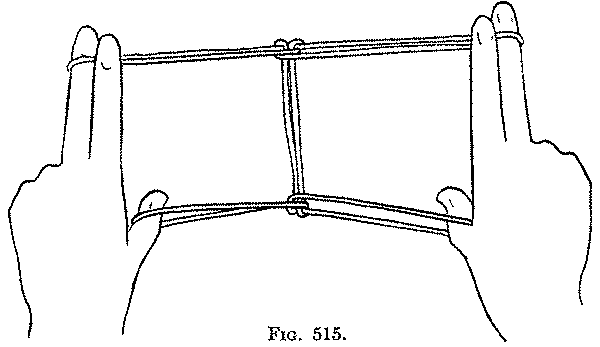 500), and turn the right hand with the palm to the left, and turn the left thumb down and then up toward you, and point the left index upward (Fig. 501). 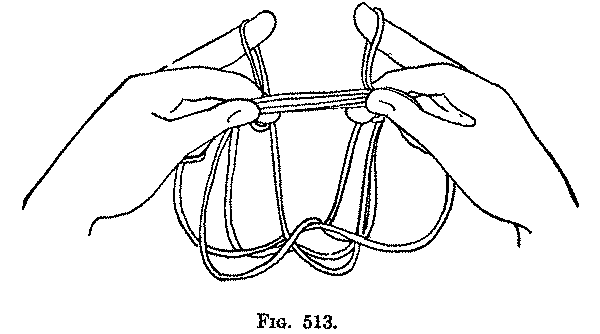 Now separate the hands, drawing the strings through the right thumb and index, and pull them tight (Fig. 502). Second: Turn the palms toward you, and put the middle, ring and little fingers of each hand from below into the index loop (Fig. 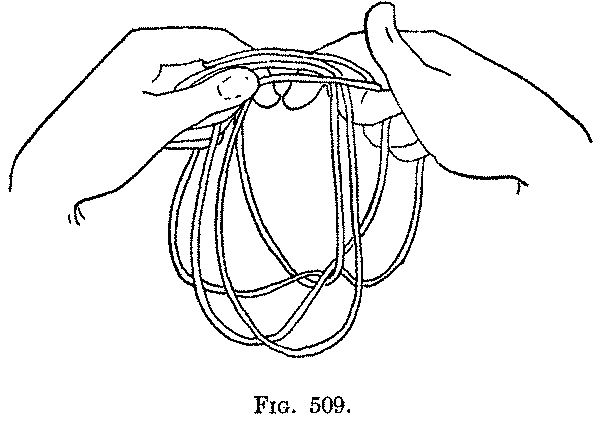 503, Left hand), and bend these fingers toward you down over the near index string (Fig. 503, Right hand). 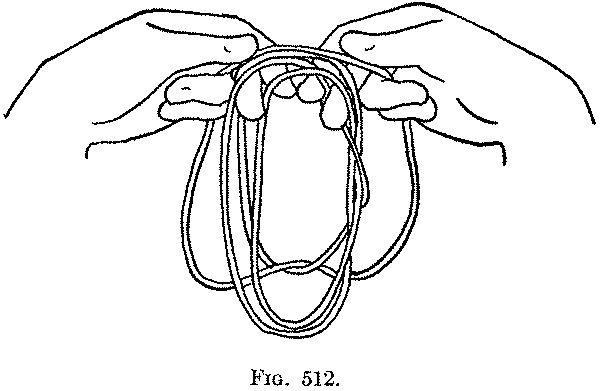 Then, holding this string down with the ring and little fingers, put the middle finger from above into the thumb loop, and close the middle finger down on the palm, holding the string in the bend of the finger as you turn the hands so that the palms face each other (Fig. 504). 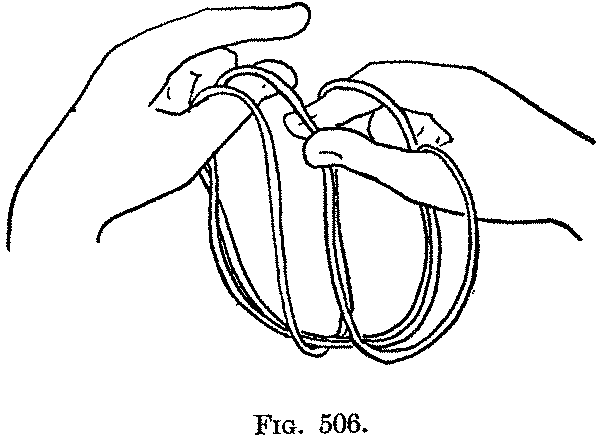 You now have on each hand: (1) a near thumb string which passes behind the thumb, then away from you around the bent middle finger, and then straight across to the other middle finger; (2) a far little finger string which passes toward you under the bent little, ring and middle fingers, up on the near side of the index, away from you around its tip and finally, as a far index string, to the centre of the figure. Third: Bring the hands close together, the thumb and index of one hand pointing toward the thumb and index of the other hand (Fig. 505), and keep throughout the following movements the other fingers closed on the palm, in order to hold their strings securely. With the right thumb and index lay the left index string over the left thumb beside the left thumb string and on the far side of it. Withdraw the left index (Fig. 506). With the right index put the right index loop over the left thumb (Fig. 507) and withdraw the right index. See that this string is close beside the other two, on the side nearest the tip of the thumb. 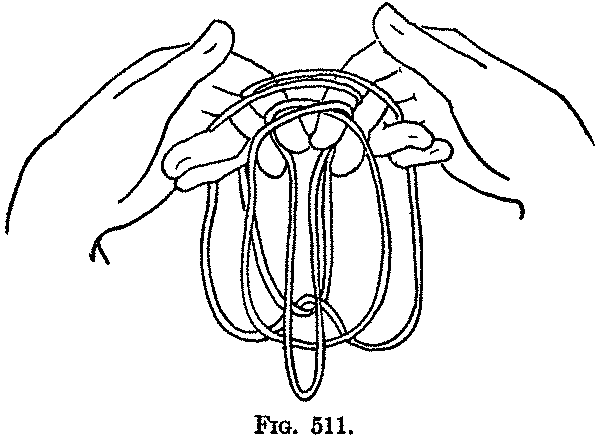 Put both index fingers toward you under these three strings and withdraw the left thumb (Fig. 508). With the left thumb draw the right thumb string across the index fingers on the near side of the other three strings (Fig. 509). 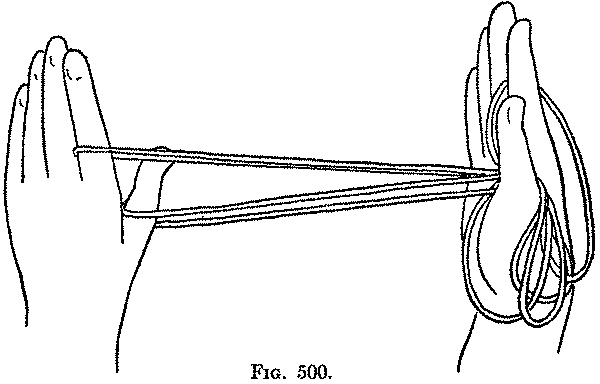 There are now four strings passing over the sides of the index fingers: On the right hand, the near string passes over the index and middle fingers and out between the middle finger and the ring finger. 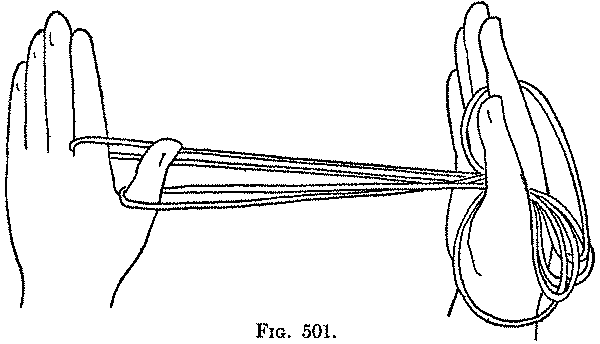 The two middle strings pass around the index only, and the far string passes around all the fingers closed on the palm; on the left hand, the near string and the far string pass around the index only, and of the two middle strings, the near one passes over both index and middle fingers and out between the middle finger and ring finger, and the far one passes around all the fingers closed on the palm (Fig. 510). Fourth: Hold the index fingers back to back with their tips pointing toward you and push toward you with each thumb (out to the tip of the index) the string which, crossing the index and middle fingers, passes between the middle and ring fingers (Fig. 511). Hold all the strings on the index fingers by pressing down the thumbs. 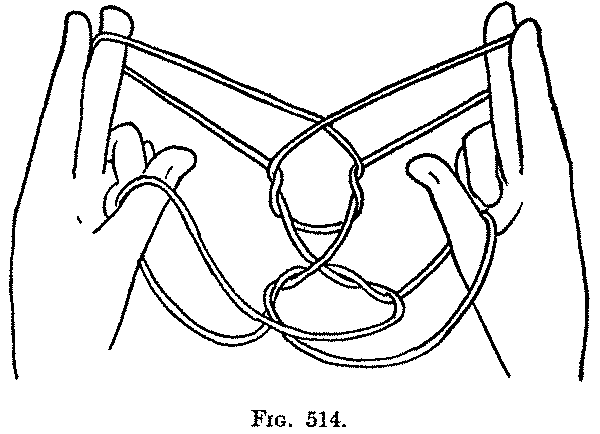 Withdraw each middle finger, away from you, entirely out of the hanging loops, and insert it again, toward you, between the other hanging strings and the hanging part of the string held toward you on the tip of the index (Fig. 512). 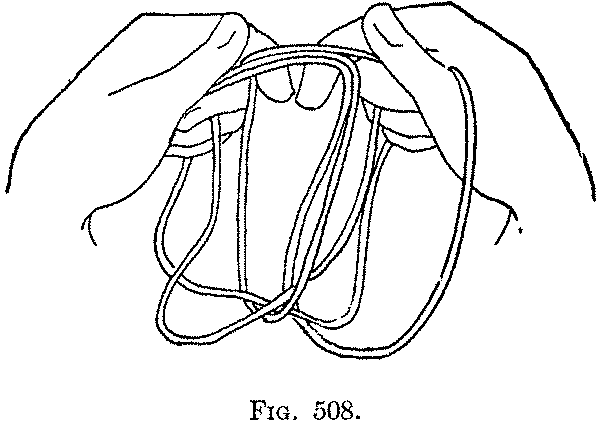 Draw each of these latter strings away from you through the hanging loops by straightening the middle finger (Fig. 513). 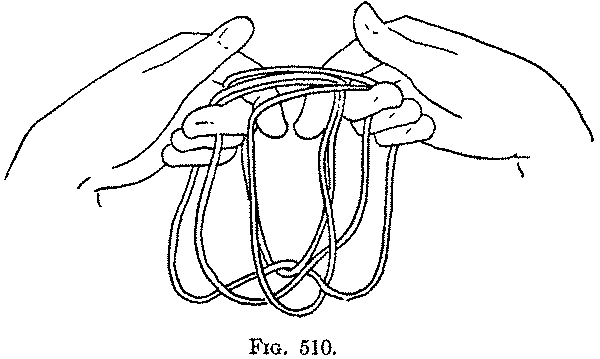 Then pass each thumb away from you, above the ring finger and under the string which is still held to the palm by the ring and little fingers (Fig. 514). The strings are thus released from the index fingers. 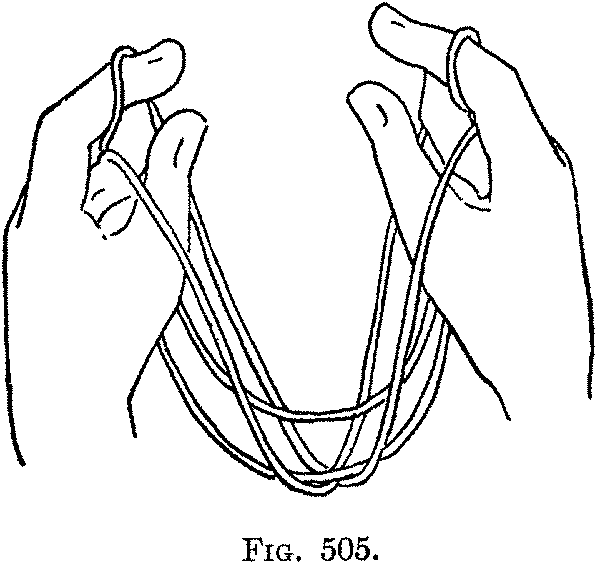 Release the string held down by each ring and little finger; separate the hands, with the palms turned away from you, and extend the figure between the thumbs and middle fingers (Fig. 515). This figure has several novel movements; the Third and Fourth are rather hard to learn, but should present no difficulties in execution. With practice the figure can be formed rapidly and with certainty. 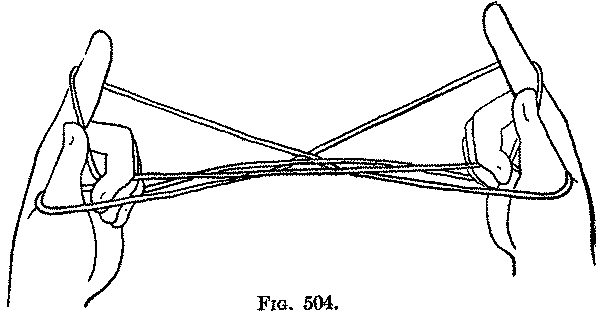 The pattern produced by the opening movement is very like the pattern produced by the opening movement of the "Bow" but the lower straight string passes on the near side of the near thumb strings, and not on the far side of them.